Marzipan and chocolate pumpkins, witches, spider webs, ghosts... no doubt about it, Halloween is almost upon us. Americans tend to consider the holiday their very own; the truth is that this anglo-saxon festival is probably of celtic origin and almost certainly originated in Ireland from where it was exported to Canada, the United States, Australia, and other English-speaking countries. When we arrived in France in 1990, Halloween was practically unknown; people who had heard of it spoke of a strange custom of les Américains. 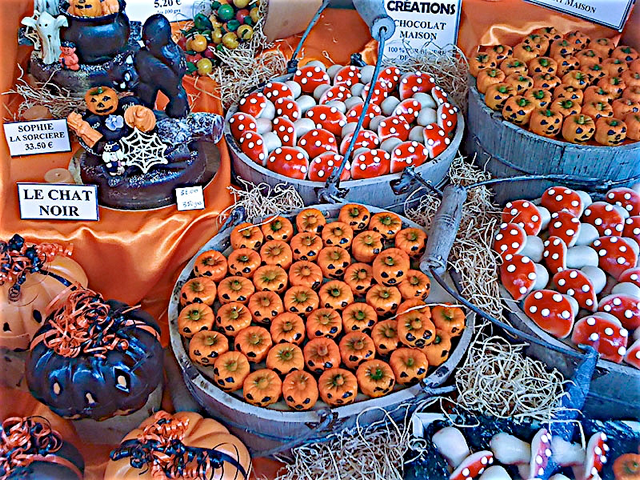 The tradition was briefly popularized here around 2000, mostly by McDonald’s and Disneyland Paris; today, French trick or treaters are practically extinct, and all that remains are store window displays such as the one shown in today’s photo.